Part 2 extends Part 1 of the tutorial to create both large and small dots, as a demonstration of how to use global variables. Make sure you've completed the Set Up process and you have your completed project from PaintPot Part 1 loaded. 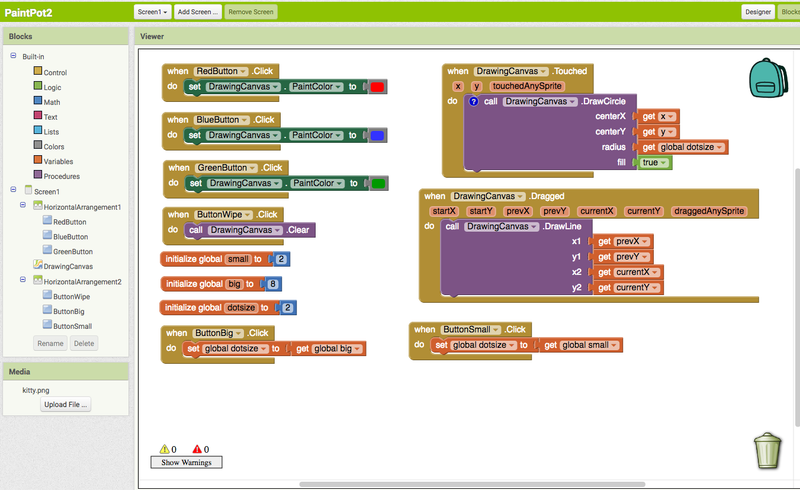 Start where you left off at the end of Part 1, with the project open in App Inventor. Use the Save As button to make a copy of PaintPot so you can work on the new version without affecting the original version. Name the copy "PaintPotV2" (with no spaces). After saving a copy, you should see PaintPotV2 in the Designer. The size of the dots drawn on the canvas is determined in the when DrawingCanvas.Touched event handler where call Drawing.DrawCircle is called with r, the radius of the circle, equal to 5. To change the thickness, all we need to do is use different values for r. Use r = 2 for small dots and r = 8 for large dots. Open the Blocks Editor if it isn't already open and connect the phone. Your phone should show the buttons and the canvas you built previously. In the Blocks Editor, in the Built-In column, open the Variables drawer. Drag out a initialize global name to block. Change the text that reads "name" to read "small". A yellow warning exclamation mark might appear on the block. If you mouse over this you'll see a warning message explaining that the block has an empty socket. You've now defined a global variable named small whose value is the number 2. Similar to small, define a global variable big, whose value is 8. Finally, define a global variable dotsize and give it an initial value of 2. You might wonder whether it would be better programming style to make the initial value of dotsize be the value of small rather than 2. That would be true, except for a subtle programming point: Doing that would be relying on the assumption that small will already have a value at the point in time when dotsize is assigned its value. In App Inventor, you can't make assumptions about the order in which different def blocks will be processed. In general, of course, you really would like to specify the order in which variables are assigned. You can do this by assigning all values when the application is initialized, using the Screen initialize event. The Quiz Me tutorial gives an example of initialization. Now go back to the touch event handler you set up in Part 1 and change the call to DrawCircle block so that it uses the value of dotsize rather than always using 5. These blocks were automatically created and put in the dropdown of get and set variable blocks, similarly to the way that x and y were created in the dropdown when you defined the when DrawingCanvas.Touched event handler in the part 1 of this tutorial. "Global" means "global variable", in contrast to the event-handler arguments, which are considered "local variables". The difference is that the argument values are accessible only within the body of the event handler, while global variables are accessible throughout the entire program. Go to the when MyCanvas.Touched event handler and replace the number 5 block in call DrawCircle with the get dotsize block from the Variables drawer. Now set up a way to change dotsize to be small (2) or big (8). Do this with buttons. In the Designer, drag a HorizontalArrangement component into the Viewer pane below the DrawingCanvas component. Name the component "BottomButtons". Drag the existing ButtonWipe into BottomButtons. Drag two more button components from the Palette into BottomButtons, placing them next to ButtonWipe. Name the buttons "ButtonBig" and "ButtonSmall", and set their Text to read "Big dots" and "Small dots", respectively. In the Blocks Editor, create a when ... Clicked event handler for ButtonSmall that changes dotsize to be the value of small. To change dotsize use the set global dotsize to block from the MyDefinitions drawer and plug in the global small block. Make a similar event handler for ButtonBig. You're done! You can draw in PaintPot and use the new buttons to draw either big dots or small dots. Notice that dragging your finger still produces a thin line. That's because the changes we just made don't affect how DrawLine is called. A bug for you to work on: The program you just built has a slight bug. If you start drawing before pressing any of the paint buttons, the paint color will be black; however, after you choose a color, there's no way to get back to black. Think about how you could fix that. You create global variables by using def blocks from the Variables drawer. For each global variable you define, App Inventor automatically supplies a global block that gives the value of the variable, and a set global ... to block for changing the value of the variable. These blocks can be found in the Variables drawer. Done with PaintPot? Return to the other tutorials here.